Has anyone else noticed a trend of pastel colored holiday decorations making an appearance this time of year? Long gone are the days of just red and green! 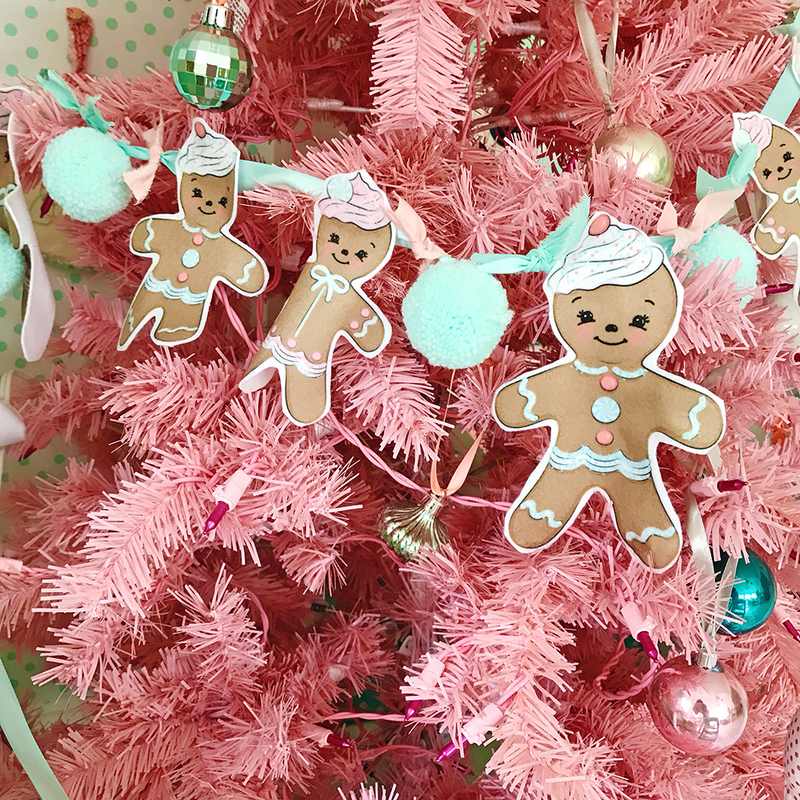 Today we’re excited to welcome the original pastel Christmas Queen herself, Lindsey Bonnice, the creator of the whimsical world of Live Sweet. 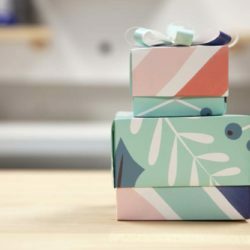 You may remember the Organic Sweet Pea Gauze™ swaddle blankets Lindsey shared this spring, but today, she’s visiting the blog to share a DIY project just in time for your holiday celebrations. 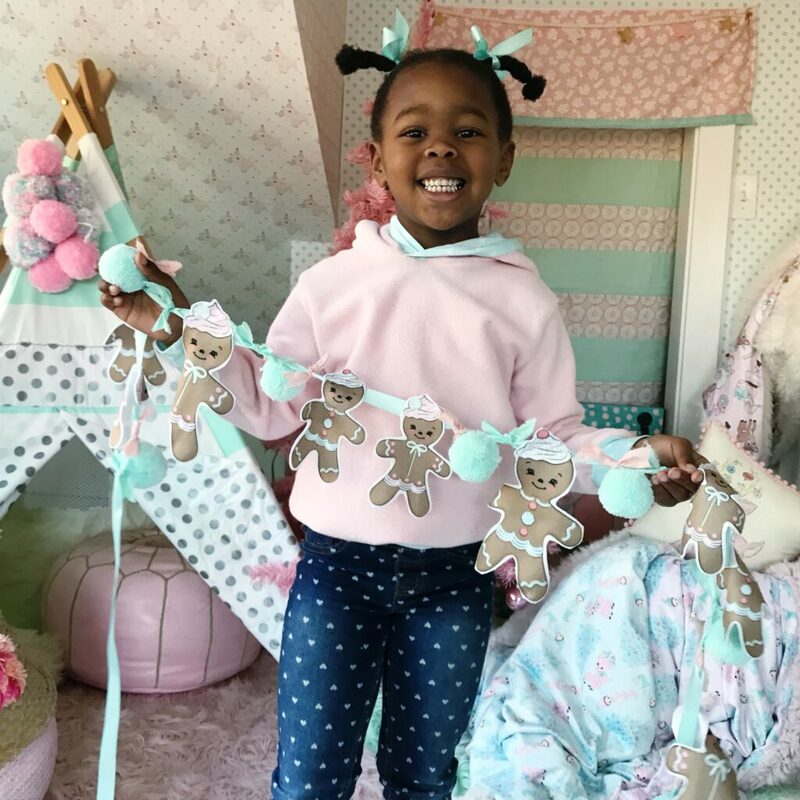 If you’ve been looking for a new addition to your handmade holiday but with a twist, Lindsey’s DIY fleece gingerbread bunting is just the project you need! 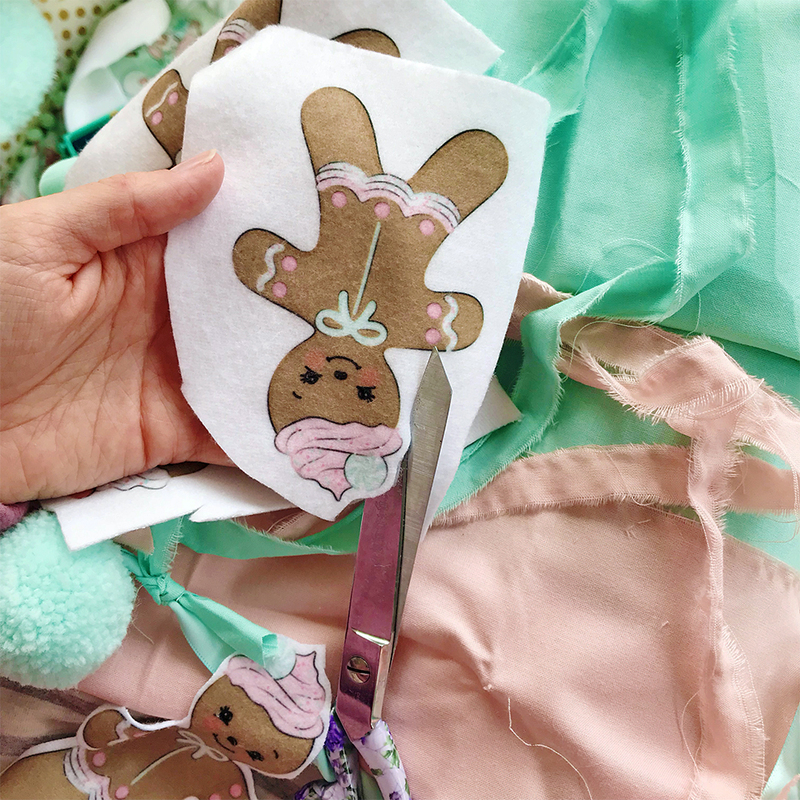 With this easy no-sew project, you can have your gingerbread bunting finished and on display in under an hour! 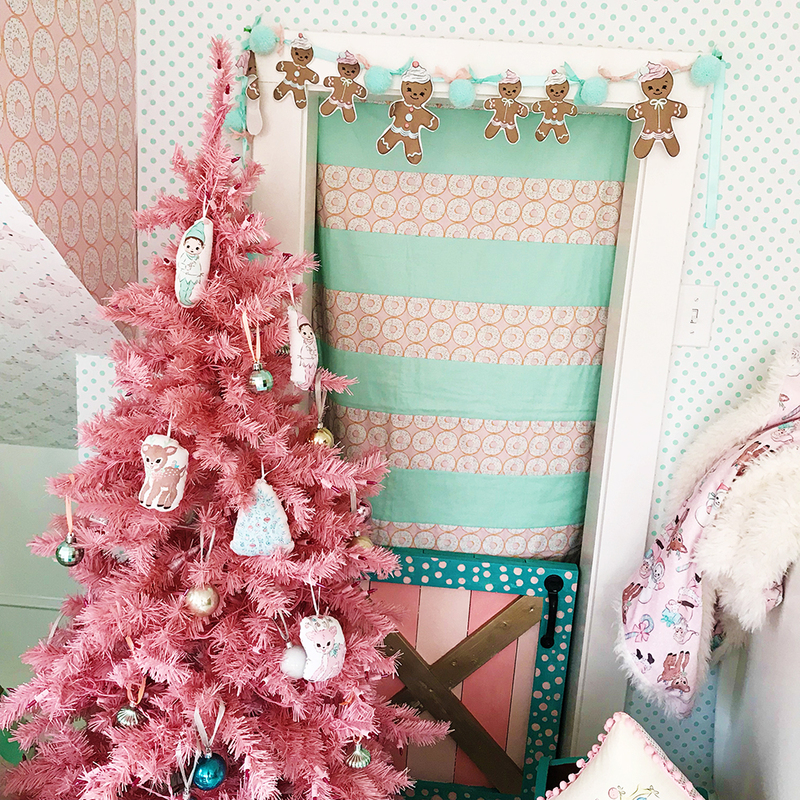 Lindsey: Christmas is my favorite time of year and getting out all of my pastel Christmas decor makes me feel all warm and fuzzy inside! 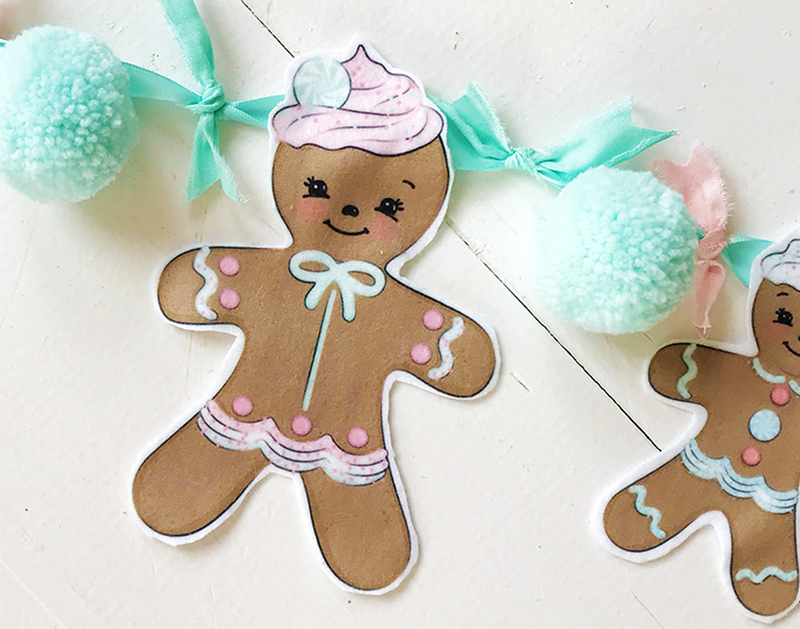 I’m always looking for new ways to decorate for Christmas and I know most of you are too which is why I’m so excited to share with all of you this super fun, super cute and super easy no-sew gingerbread bunting! 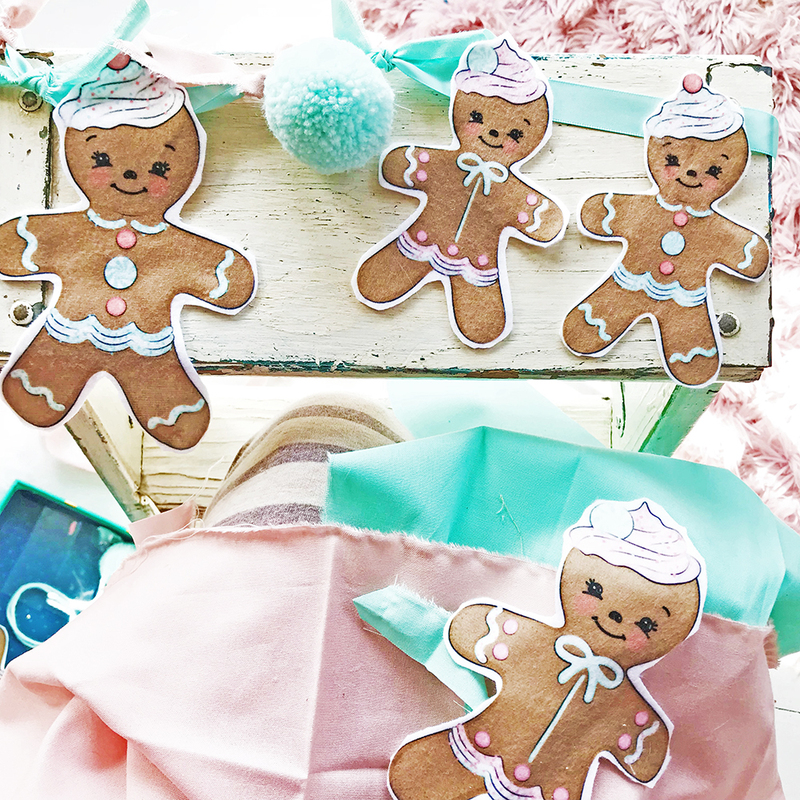 Pom poms and fabric ties add an extra festive touch to your gingerbread bunting. 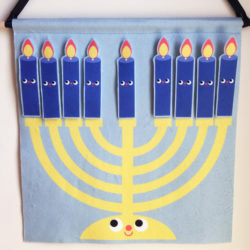 To start your gingerbread project, order one yard of my custom gingerbread bunting on fleece. I put two different size boy and girl gingerbreads on here so you can make a larger garland, tiny garland or combine the large and small together like I did. Next, cut the ribbon the length you’d like your bunting to be. 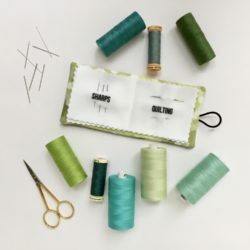 I’ll be hanging my bunting above our door which is 32″ wide so my ribbon will be three feet long, enough to allow for a scalloped look when hanging! Cut around the border of your gingerbread people. I left a thin white border around mine but you can cut directly around the gingerbread outline if you prefer! To attach your gingerbread people to your ribbon, lay out the ribbon flat. Next, attach a piece of double sided foam adhesive to the back of your gingerbread’s hat and apply to the ribbon. If you’re using the hot glue gun method, add a small dab of glue on the back of the gingerbread hat and apply the ribbon. Pro tip: Create an easy gingerbread plushie by sewing together two gingerbread people, right sides facing. Flip right side out and stuff with fiber fill! Secure the opening with a ladder stitch. To add some extra flare to the bunting, I added fabric ties and pom poms. 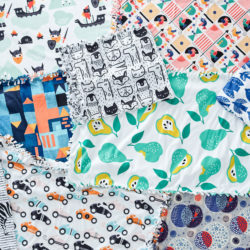 If your fabric collection is getting a bit unruly, this is a great stash-buster! To create the fabric ties, tear thin strips of your scrap fabric and cut them into three inch pieces. Tie your fabric strips on either side of your gingerbread person. Add pom poms for an extra festive look! 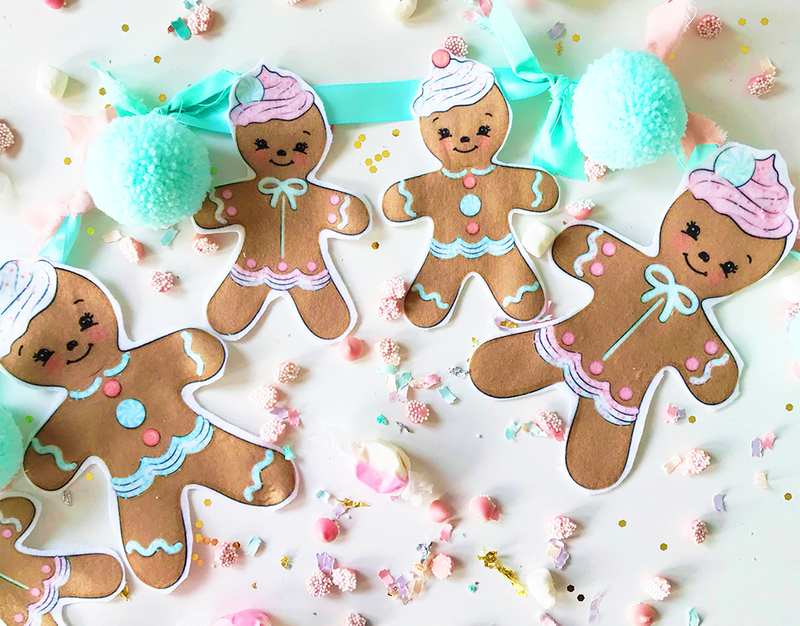 Repeat these steps until you’ve created a gingerbread garland that will satisfy any sweet tooth! 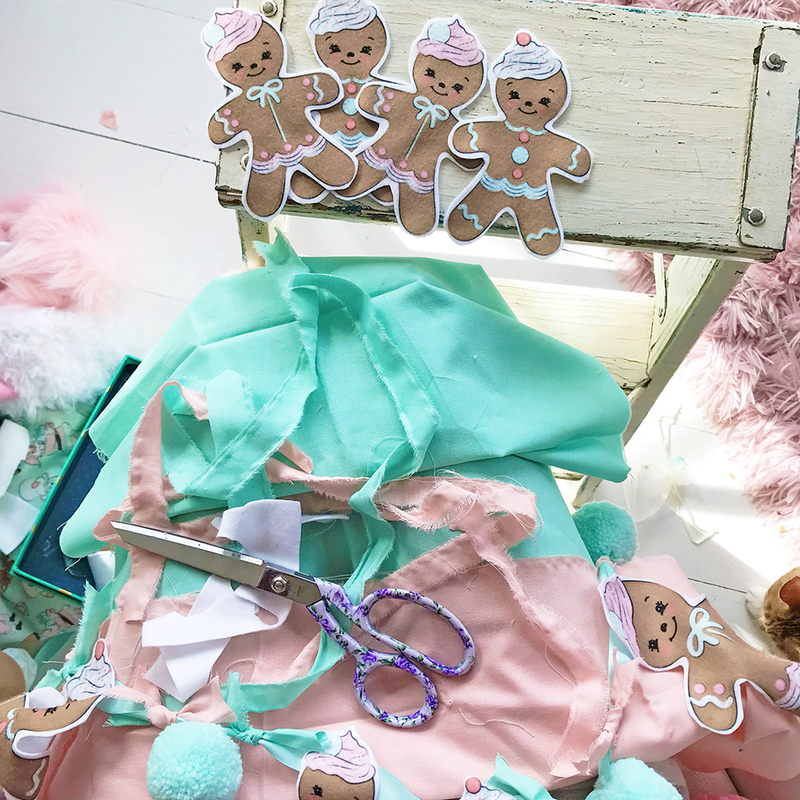 Gingerbread bunting and our favorite Live Sweet model, Libby…does it get any cuter? I was able to make this sweet garland in just about an hour and I still have extra gingerbread people so I could make a few more garlands for Christmas gifts or other fun DIY projects. I think they would also make the cutest little Christmas gift tags! 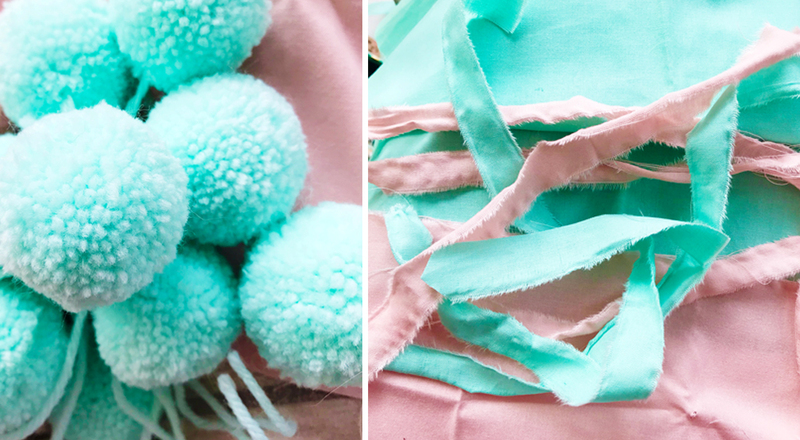 Looking for even more festive fleece projects? 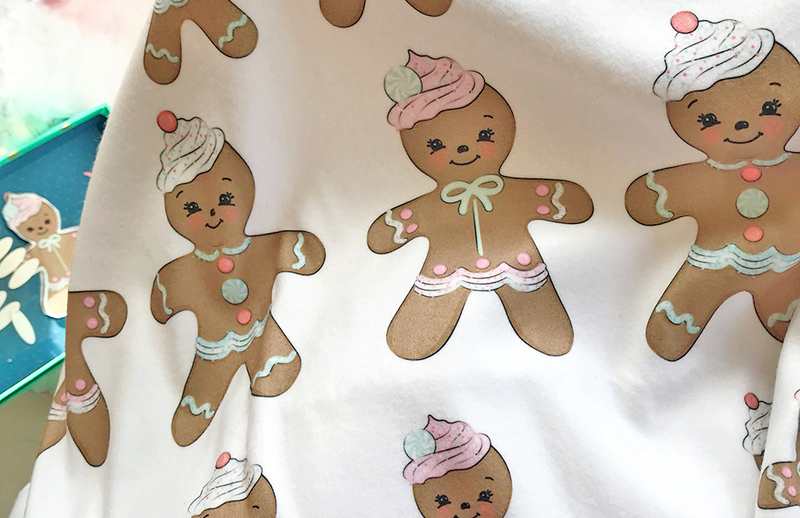 Spoonflower’s DIY stocking is the perfect match for your gingerbread bunting. 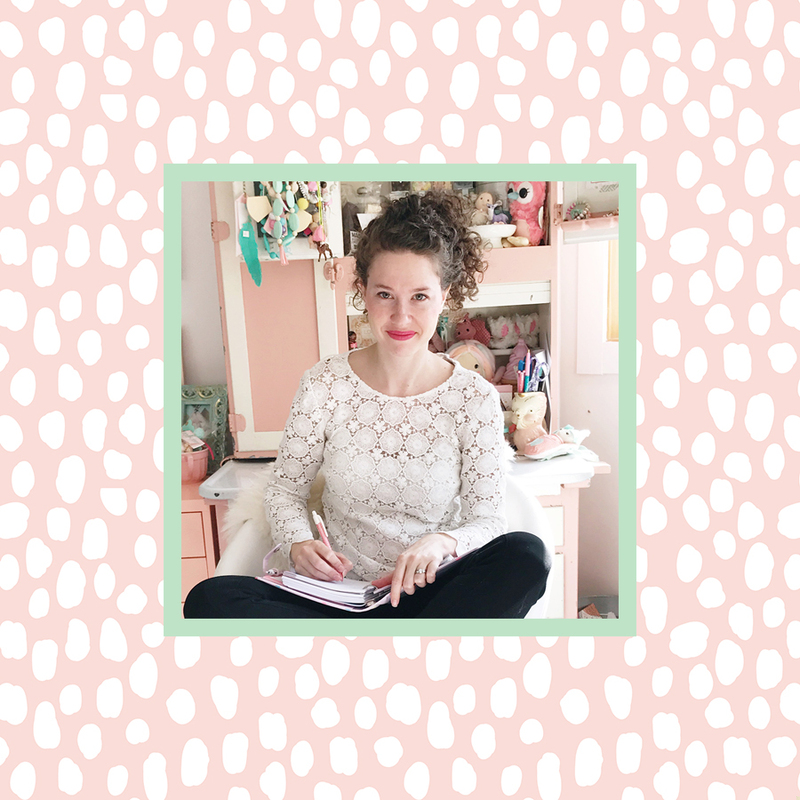 Lindsey is the creator behind the whimsical world of Live Sweet! When she’s not busy creating for the pastel colored Live Sweet world, she’s spending time on her family lake with her high school sweet heart Fil, and their three children, Noah, Libby and Finn, not to mention a zillion fuzzy critters. Following along with Lindsey and her family adventures on Instagram.